Well today I had a haircut - and for the first time, L-kun came with me. He was a very good boy (if a little shy), but was very well looked after by our hairdresser (the subject of a later post perhaps). He was lucky enough to get a very yummy biscuit from the cafe next door (and Daddy had a delicious cappuccino as well). Actually, there was a bit of return-of-service required however... including some well needed hair brushing of Daddy's shoulders... a job that L-kun took completely seriously. Actually, one thing about L-kun is that he's actually quite a tidy boy (not that you'd necessarily pick that from his room, or the rest of our house that is). 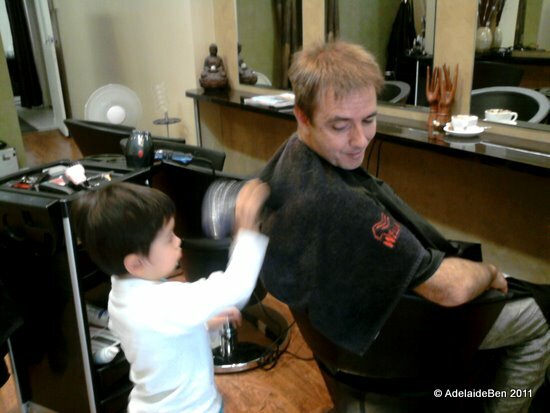 If you're looking for a great haircut in Adelaide, try out Elevate on 206 Hutt Street, (Ph: 8232 8025). I'll give them a proper speel later on.